Now that we understand how powerful the Simple Inked Marketing is, let's set it up. Go to the Admin > SMS & Email tab. In there you'll find the 1-Touch Marketing section. 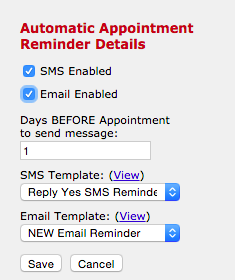 Edit your 1st Appointment Reminder and tick SMS Enabled and/or Email Enabled. You can send out your appointment reminders via SMS and Email, or one or the other - you choose. Enter in the number of Days BEFORE Appointment to send message and the system will automatically send out the reminders this number of days before the appointments. The SMS Template and Email Template are currently set to the default templates, which we have created for you. NOTE: You are more than welcome to come up with your own SMS and Email Reminder message. For info on how to do this, check out the Creating & Editing SMS & Email Templates article. Then once you've created your template, come back here and select, from the SMS Template and Email Template drop-down menus, the template you wish to use for reminders. This applies to all of the 1-Touch Marketing options outlined in the rest of the article. Save your 1st Appointment Reminder and you're done. One SMS is 160 characters. If you go over 160 characters, the system will automatically allow you to use more than 160 characters, however, you will be charged for two SMS's. If you do not wish to go over the 160 character limit, you can un-tick the Allow Multiple SMS Messages setting in your Marketing Settings, via Settings. If you would like 2 rounds of appointment reminders, then set the 1st Appointment Reminder to send a longer number of days before the appointment i.e. 7 days before, and the 2nd Appointment Reminder to send a lesser number of days before the appointment i.e. 2 days before. Follow the same steps as the 1st Appointment Reminder to set it up. This means that the client will receive an automated SMS and/or email after their first appointment at your studio. You can choose the number of days after their first appointment for the system to send them their message. Edit your First Visit Message and tick SMS Enabled and/or Email Enabled. 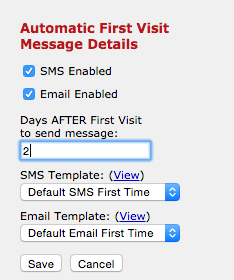 Enter in the number of Days AFTER Appointment to send message select the templates you wish to use and Save. (Again, you can create your own templates as mentioned above). This means that the client will receive an automated SMS and/or Email before their birthday, or on their birthday. Edit your Birthday Message and tick SMS Enabled and/or Email Enabled. 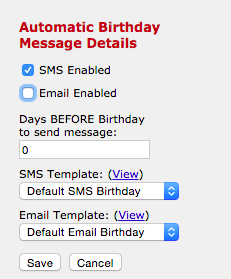 Enter in the number of Days BEFORE Birthday to send message select the templates you wish to use and Save. (If you want them to receive their message on the day of their birthday, enter 0 into this field). This means that the client will receive an automated SMS and/or Email after they have been added into your database as a new client. Edit your New Client Message and tick SMS Enabled and/or Email Enabled. 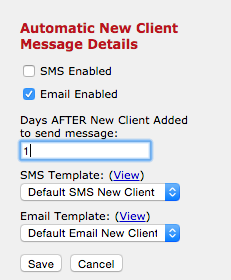 Enter in the number of Days AFTER New Client Added to send message select the templates you wish to use and Save. Edit the Clients Who Haven't Been In message type. On the right side panel, you can tick SMS Enabled and/or Email Enabled. Set the number of months for No visit in the last. Then choose the date the message will send each month. 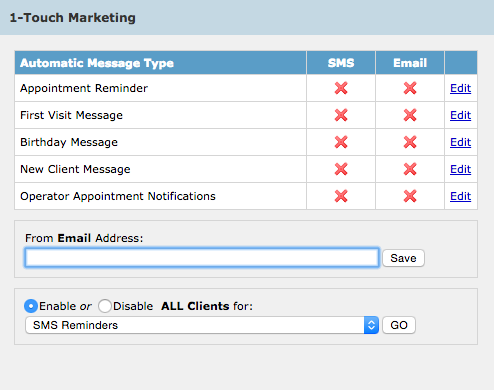 Select SMS/Email templates and Save. Check out the Operator Appointment Notifications article for steps on setting up your Operator Appointment Notifications. Edit the Appointment Follow Up message type. On the right side panel, you can tick SMS Enabled and/or Email Enabled. Set it to Days After or Hours After, then set the number of days after to Send Message. You can apply it to all services or set it to send only for specific services. Select SMS/Email templates and Save. Edit the Re-book Reminder message type. On the right side panel, you can tick SMS Enabled and/or Email Enabled. Set it to send a number of weeks after message. You can apply it to all services or set it to send only for specific services. Select SMS/Email templates and Save. There you have it, your automatic Simple Inked Marketing. Now sit back and relax and watch how Simple Inked does the work for you.